Schnappen Sie sich Ihre Kamera und erkunden Sie auf dieser ganztägigen Tour ab Dublin einige der beeindruckendsten Naturwunder Irlands. Erkunden Sie die unberührten Landschaften des Fischerdorfes Kinvara und fotografieren Sie das Bunratty Castle. Anschließend wandern Sie entlang der mächtigen Klippen von Moher und bewundern Sie die Aussicht, während Sie einen Teil des Wild Atlantic Way fahren. Beginnen Sie früh und starten Sie von Dublin aus zu Ihrer ganztägigen Tour durch Irlands westliche Wunder. Genießen Sie die Landschaft auf der etwa 2,5-stündigen Fahrt zur Westküste und schlängeln Sie sich dann entlang der dramatischen Küste des Wild Atlantic Way. Springen Sie aus, um Fotos von dem auffälligen Dunguaire Castle zu machen, einem Turm aus dem 16. Jahrhundert, der sich nördlich von Kinvara an der Küste befindet, und dann weiter nach Doolin. In Ihrer Freizeit können Sie das malerische Fischerdorf erkunden und ein Mittagessen genießen (auf eigene Kosten). Probieren Sie den berühmten Fischsuppe von Gus O'Conner oder ein Glas Guinness in Fitzgeralds Pub. Wenn Ihr Appetit gestillt ist, fahren Sie zu The Burren und erkunden Sie die jenseitige Karstlandschaft, die für ihre exotischen Pflanzen und farbenfrohen Orchideen bekannt ist. 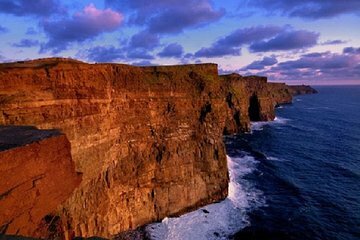 Schließlich sollten Sie sich für die Hauptattraktion des Tages, die Cliffs of Moher, entscheiden und viel Zeit haben, um die 214 Meter hohen Klippen entlang zu spazieren und über die raue Atlantikküste zu schauen. Bewundern Sie die atemberaubende Aussicht auf die Aran-Inseln und die Bucht von Galway und erfahren Sie mehr über das geologische Wunder im Atlantic Edge Exhibition and Visitor Center. Nach einem ganzen Tag an der Westküste fahren Sie zurück nach Dublin und beenden Ihre Tour im Stadtzentrum. This is the perfect way to take in the sights of beautiful Ireland! The Cliffs are absolutely breathtaking and magical. Our tour guide was top notch and I’m happy to say I made some great new friends! That was the most stunning, breathtaking, unbelievable experience I've ever had. It was my 28th birthday, and my friend and I decided to take this tour. Easily the best day of my life tour guide was top of the line, and the views were absolute gold. I'd give it a million stars if I could. This tour was amazing. Our bus driver/tour guide Valentine aka Val was hilarious and so helpful. He made the time on the bus fly by. We stopped at Dunguaire Castle, the Burren, an amazing pub lunch at Fitzpatrick's Bar in Doolin, the Cliffs of Moher, and Bunratty Castle. The Cliffs of Moher are so breathtakingly beautiful and Val even recommended the best way to travel around and view them. He seriously made a bus ride enjoyable! I didn't feel rushed at any point, and I am so glad I took this trip. The tour was excellent and very comfortable. Valentine O'Brian, our bus driver and guide was AWESOME!!! He made the tour enjoyable. All in all great tour and worth every penny. Plus, Val taught us a new word. Take the tour and you'll learn it too. Amazing! Our tour guide, Gavin, was super informative. The views were beautiful! This tour took us to some excellent locations! I really loved the Cliffs of Moher and the Baby Cliffs, and the little pockets of history we passed along the way were amazing as well! The tour guide highlighted these things as we passed by, unfortunately waffling at times so that I kept losing focus in what he was saying. As enthusiastic as our guide was, I was offended by many of his misogynistic jokes and Irish stereotypes which I felt were totally unnecessary. I was also very unsettled by him telling the history of Saint Patrick just wrong - saying he was kidnapped as a child, when St. Patrick already had a wife and kids when he was taken as a slave. I feel that it's a tour guide's responsibility to tell the truth, not juice things up at the expense of accuracy. Still, it was not enough to ruin our trip - my boyfriend and I really loved the locations and will never forget our experience. Take the boat tour as well if it is offered. The scenery from below is spectacular and totally different than from above. This tour would have received a higher rating, but for two things-a very small bus and the bus driver wasn't able to turn off the heat. It was a very uncomfortable ride being stuffed into seats like sardines in a very hot space. I'm glad I was sitting next to someone I knew, as it would have been very awkward sitting next to a stranger. Our tour guide was very low key, and honestly, we never did catch his name. On the positive side, the Cliffs and other stops made were beautiful. Plus Fitzgerald's Pub had the best food we experienced on our entire seven day stay.